The Canadian built 25pdr Sexton gradually replaced the American built 105 mm M7 Priest self-propelled artillery gun used by the British and Commonwealth forces in WW2 from September 1943 onwards. They were used in Italy and the invasion of Normandy D-Day 6th June 1944. The four tanks at the Bayeux Memorial Museum of the Battle of Normandy are exhibited outside the Museum near the car park. The Sexton SPG is inside. The British and Commonwealth Cemetery is on the other side of the road. It holds the graves of 4,000 men. Both the Military Cemetery and the Museum are on the road called Boulevard Fabian Ware in Bayeux. This road is part of the ring road around Bayeux that was built by the British Royal Engineers in June to enable the troops, tanks and supply vehicles to get to the battlefront quickly and avoid having to struggle through the narrow streets of the city of Bayeux. Be aware that the museum closes for lunch. You can still see the tanks as they are outside even if the museum is closed. 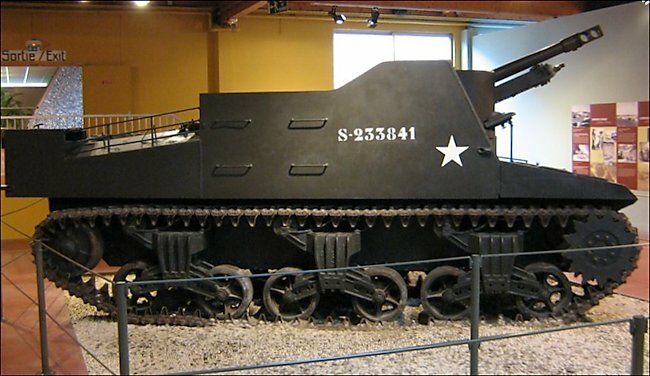 The first Sexton SPG was based on the American M3 Lee tank but then the Canadian built M4 Sherman Grizzly tank. It was powered by a Continental R-975 9-cylinder radial petrol engine that produced 400 hp. It had a top speed of 25 mph (40 km/h). It had a crew of 6: commander, driver, gunner, gun-layer, loader and radio operator. They were protected from small arms fire, high explosive and mortar shell shrapnel by armour that ranged in thickness from 15 mm to 32 mm. The gun was an Ordnance QF 25-pounder (87.6mm) Mk II. The Sexton carried 105 rounds, mainly high explosive HE shells. Some were smoke rounds and a few were armour piercing AP rounds incase of surprise attack by a German tank. For self defence the Sexton crew were issued with two 0.303 (7.70mm) Bren Light machine guns. 25pdr Sexton Self-propelled Artillery Gun with muzzle brake to reduce recoil. Essentially the Sexton 25pdr self-propelled artillery gun was a British/Canadian version of the American M7 Pries. The Sexton was developed in the latter half of 1942 to meet British General Staff requirements for a self-propelled gun with all the mobility and characteristics of the M7 HMC but with the standard British 25pdr field howitzer in place of the American 105mm weapon. 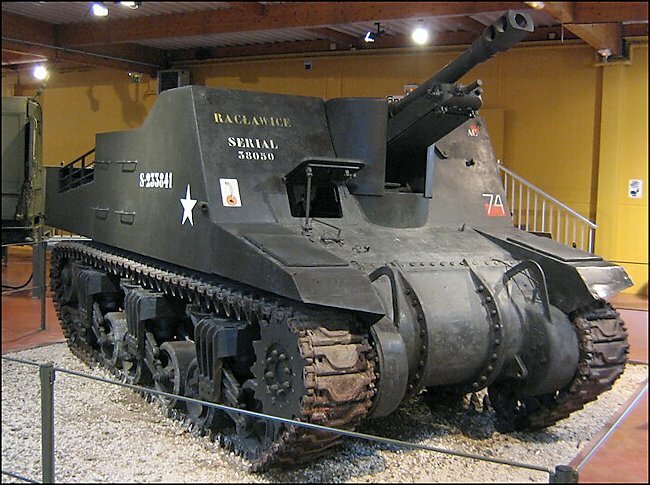 As a basis, the Ram chassis (itself fundamentally the US M3 Lee medium tank chassis built in Canada) was used. 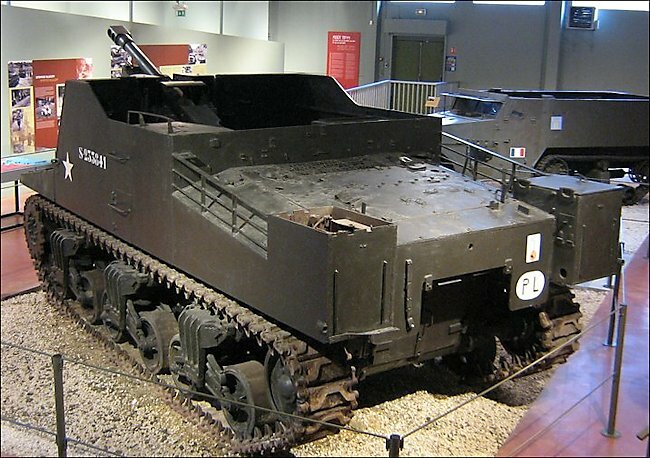 Layout was similar to that of the M7, but the driving position was on the right and the gun was offset to the left, since the Ram chassis had the driver's position shifted to the right hand side. A small ammunitioning hatch was provided in the left hand side, and there was no ring mount for an AA gun as in the M7. The standard 25pdr howitzer was mounted, but in order to give sufficient elevation it was necessary to limit the recoil throw. Built by Montreal Locomotive, the pilot model was shipped to Britain for tests and approval, and production commenced at Montreal Locomotive Works in early 1943, 424 vehicles being completed by the year's end. Successive orders from Britain, kept the vehicle, named Sexton, in production until the end of 1945, by which time 2,150 had been completed. The Sexton chassis was identical to the Ram in early production vehicles, with a welded superstructure. Changes introduced during production included the adoption of a one-piece cast nose (as on late M4 medium tanks), M4 type bogies with trailing return rollers, a towing hook at rear for ammunition trailer, provision of an auxiliary generator, stowage for extra equipment, and mounts for Bren AA machine guns. The M7 Priest had entered service with the British in October 1942 under Lend-Lease arrangements. As the Sexton became available it gradually replaced M7 Priests in the field regiments of armoured divisions, the M7 being entirely superseded by mid 1944. Sextons remained in British and Canadian service for many years post-war. The Sexton GPO: Introduced in late 1943 (the prototype was designated 'G' vehicle), this was a Sexton with gun removed and extra equipment added for gun position officers (GPO) of Sexton batteries. It was fitted with extra radio, map tables, extra telephone cables, and an extra Tannoy unit.